The First Amendment to the U.S. Constitution has undergone constant legal challenges since it was enacted back in 1791, though U.S. courts have tended to consistently uphold its underlying principles. Among other things, the courts always seem to recognize that allowing people or entities to take control of the narrative provides them with too much power, and that such power can quickly be abused. As repugnant as it may seem to many Conservatives, even desecration of the flag was upheld by the U.S. Supreme Court as a form of free speech protected by the First Amendment. From my understanding of the high court’s rulings on the issue, flag burning and other desecration was considered a form of protest against the government, and its ban by the government represented a slippery slope from which it could then ban other forms of protest. As a long-time free speech/First Amendment absolutist, I personally support the Supreme Court’s decision-making in this regard. The campus Free Speech Movement which arose at UC Berkeley in 1964 emerged because students realized that university administrators controlled the narrative by prohibiting political activity on campus and by impinging upon other First Amendment principles, such as freedom of association. Had the students taken the school to federal court, they undoubtedly would have won their case. As it was, they won anyway through school administration acquiescence, and their victory seeped onto university and college campuses across the country, giving American youth newfound freedoms that they used to help end the war in Viet Nam and give voice to other important causes. Not that college administrators totally caved to the students, as free speech on American campuses has been a somewhat constant source of conflict between students and administrators ever since. 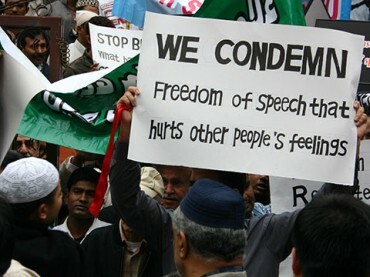 In the 1980s and first half of the 1990s the establishment of free speech zones and other measures became especially popular as a means of cutting back on student free speech rights. These zones and other measures are adopted under U.S. court decisions that stipulate that the government can regulate the time, place and manner of expression, but not the actual content of forms of speech. Of course, administrators often overreach, and numerous court challenges have forced many to abandon or significantly expand the “zones” and related measures. Cut to today, though, and the biggest threat to student free speech is not so much administrators but, instead, other students. And ironically, the birthplace of campus free speech—Berkeley—has proven to be one of the most student-driven opponents of campus free speech in the nation. Of course, we’re not talking about any campus free speech, we’re talking about Conservative campus free speech, which has been under accelerating attack for at least the past eight years, that reached a crescendo with the election of Donald Trump for President. Liberal student activists across the country, and often with support from faculty and administrators, have become aggressive campus censors devoted to shutting down any “speech” supporting Conservative values, and any that is the least bit critical of Liberal progressive sacred cows, such as illegal immigration, Islam, LGBTQ (and whatever other letters they’ve added of late), feminism, climate change, Black Lives Matter, and any and all marginalized minorities who are under alleged oppression by the white male patriarchy. I’ve probably missed a couple here, but you get my drift. When I say “speech,” I mean any form thereof, and campus activists want all such tinged with anything Conservative to be obliterated from their campuses. Posters, flyers and other conservative outreach materials generally disappear quickly. Conservative speakers are usually confronted by enraged mobs. Woe be unto college newspaper editors who promote something Conservative or question one of the sacred cows. Well-reasoned scholars with conservative views—forget it! Even the name “Trump” chalked onto campus sidewalks has elicited fits of spontaneous protest from these paradigms of social justice virtue. Anyhow, the irony of the UC Berkeley protests which shut down the free speech of Milo Yiannapoulas in the very birthplace of campus free speech probably escapes the more than 1,500 protestors who showed up to shut down that speech “by any means necessary.” In fact, it appears that the ideals of free speech are meaningless to a rather large group of college-age students across America. These students feel that the importance of their causes trumps the free speech rights of anyone else, with some willing to spill blood for their believed right to shut down speech that they do not agree with. How many? Well, hard to know, but a 2016 survey of American college students found that 24 percent of white students and 41 percent of black students supported campus policies that restricted expressions of political views that might be upsetting or offensive to certain groups. Some students at the University of Chicago and like minded schools may end up getting offended, but they will undoubtedly graduate with keen critical thinking skills borne in part by the university’s support of rigorous debate through free speech. On the other hand, I’m pretty sure that critical thinking skills of UC Berkeley grads will be in short supply. —Originally published in Discernible Truth on Feb. 12.